A widow and her family fleeing war-ravaged London find shelter with a wealthy family and become entangled in a web of secrets and forbidden passions. In September 1940, the start of the Blitz marks the escalation of the fighting between the British and Germans. It’s an anxious time for Londoner Eleanor Kingsley. The previous year, her husband joined the Royal Air Force and was killed when his plane was shot down near Dresden. A widow at 37, Eleanor resolves to stay strong for the sake of their 14-year-old daughter, Chavalle. That fall, Eleanor also becomes the guardian of her niece Audrey after her father joins the service. With danger mounting in London, the family is ordered to evacuate the city. They end up in Winfield, where Hugh and Pauline Beresford take them in. The Beresfords’ estate, Grentham Hall, offers a world of luxury and safety. The girls befriend Hugh and Pauline’s daughter, Judith. Eleanor becomes involved with the Women’s Volunteer Service and develops an attraction to Matt Dalman, an American lieutenant. Grentham Hall’s security may prove illusory, however, as Hugh’s secret passion for Eleanor and Judith’s increasingly strange and volatile behavior threaten to destroy both families. Davies-Owens’ (Silver Linings, 1986, etc.) latest offers strong character development and historical detail with just the right amount of intrigue and romance. Eleanor is a compelling, sympathetic hero whose love for her daughter and niece is as unwavering as her determination to provide a secure home for them. The supporting characters are similarly well-drawn. Davies-Owens ably portrays the passions and compulsions that drive the Beresfords’ marriage while providing insight into Judith’s troubled behavior. Eleanor’s relationship with Matt is an especially strong subplot, unfolding slowly but poignantly as Eleanor gains the confidence to love again. Life in wartime London is sharply rendered, from the dangers of overnight bombings to the effects of rationing. 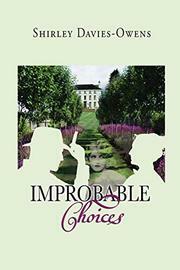 An entertaining, engaging historical novel that may appeal to Kate Morton fans.